Fear Free Visits: Why Should You Give Those Pills, Anyway? If your dog or cat gets anxious when they come to see us, there’s a good chance we’ve recommended you try giving them some anti-anxiety medication before visits. Our focus on working toward a Fear Free experience for every patient means these recommendations are increasingly frequent. Where veterinarians traditionally have used these drugs for patients who were too fractious or aggressive to handle, we have begun, as part of our Fear Free initiative, to use them in pets who don’t necessarily show any aggression but who show clear signs of distress during a visit – such as panicking during restraint, hiding in the carrier, under a chair, or in the sink and refusing to come out, being reactive to needles or to the doctor’s hands or diagnostic tools, or frantically trying to escape from the exam room. These are extremely common reactions to stress, and we know now that if an animal is doing one of these things, he or she is experiencing a level of fear and anxiety that is detrimental to their well-being and also jeopardizes their chances of getting the best possible care. We’ve noticed that sometimes our clients are nervous about giving the medications, and will decide to skip them in favor of hoping the next time will be better, or that we can get the job done without having to use them. If you’ve done this, don’t feel bad – you’re not alone, and we understand why. I’m writing today to try to show you that these very safe medications are a whole lot more likely to help your pet than they are to cause harm. Any doctor knows that while drugs can make our patients’ lives better, longer, and healthier, they can also be a little scary. I go over medication instructions at least three or four times before I prescribe anything to a patient or give anything to my own pet. When it comes to drugs intended to alleviate anxiety or that can cause some sedation, conscientious pet owners are often even more cautious – I believe in part this is due to concerns surrounding these drugs in people, such as side effects, dependence and addiction, implied mental instability or incompetence, and the sometimes controversial belief that we can just fight through anxiety in many cases to do what we need to do. But pets are different from people. They have feelings, feel fear and anxiety, and make associations with scary or positive experiences just like we do, but they don’t have a stigma they attach to the topic of prescription drugs, and they can’t choose what to take or consume – that’s our job. We also can’t explain to them why they’re in a scary place or always reassure them convincingly that they won’t be harmed. Medications become even more important when we realize how helpless we are in the face of their fear once it takes hold. – happy visits to SVH, where dogs are brought to see us when no appointment is scheduled, and our staff showers them with treats and as much (or as little) attention as they enjoy – for very nervous dogs, sometimes pulling into the parking lot, giving a reward, and leaving is a good first step, and can lead to getting out of the car, coming up to the door, entering the waiting room, etc, one step at a time until they are comfortable. As you can see, these ideas require time and lots and lots of treats to be done well. This isn’t always a luxury we have when we need to get a blood sample, give a rabies vaccine, or examine a sick pet. 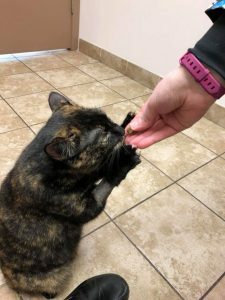 So while we encourage working with anxious pets as much as possible, and are absolutely willing to help you do this, sometimes we need a little assistance to make the next visit less stressful. That’s where our pre-visit medications come in. Drugs we reach for the most these days, such as trazodone and gabapentin, are safe for nearly every patient. We can confidently use them in pets who have heart conditions, liver or kidney disease, and metabolic disease such as diabetes, and who take most chronic medications. These drugs have an extremely wide safe dosage range, so we have flexibility to prescribe more or less depending on the pet’s individual response to the medication and the initial level of anxiety. Using a combination of drugs often means giving a lower dose of each drug and allowing them to work together to reduce stress. t if we recommend medications for your pet, we are doing so with only one goal in mind – a safer, happier, less scary experience for them, and a better opportunity for us to provide the absolute best care for both them and you. Shiloh Veterinary Hospital was established in 1979 by Dr. Thomas Schaeberle. His vision was to establish a facility where clients and their four-legged family members could receive quality care in a friendly environment. 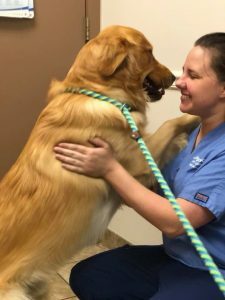 Our mission is to provide compassionate, high-quality care for our patients and their families through advanced diagnostics and treatments, continuing staff training, and most importantly, education for our clients so that they can make informed decisions regarding their pet’s health care. © Copyright 2019 - Shiloh Veterinary Hospital. Veterinary Marketing powered by iVET360.